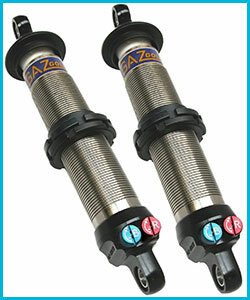 A vast range of height and damping adjustable units for road and competition use. These units are available in two diameters 1.3/4” o.d. mainly to take 1.9” i.d. coils. These units have a 12mm piston rod and a gas cell fitted in the outer reservoir. The 2” nickel plated body units are available with 12-14 or 16mm rods and a wide range of spring seat sizes. These are also fitted with a gas cell to prevent cavitation and resist fade. All units are available with bearings, bonded or polyurethane bushes. Gaz Gold height adjustable kits are a premium range of suspension units designed for tarmac motorsport and the serious track day enthusiast. 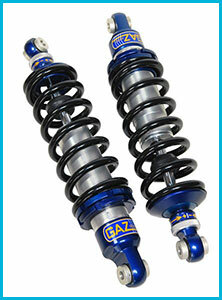 Gaz gold pro kits are a premium range of suspension units designed for fast road, track day and tarmac motorsport use. They are manufactured from high tensile alloy with induction hardened piston rods and have a multi point adjustable control knob to adjust bump and rebound. These units are filled with high viscosity index fluid to alleviate cavitation and have an internal gas cell to help prevent fade, added to this the Gaz Gold Pro range are offered with self lubricating spherical bearings and progressive bump stops. 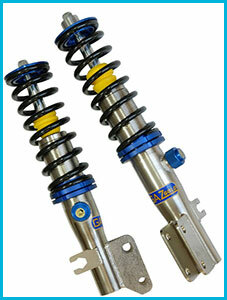 Our flagship range of independent bump and rebound adjustable coilover units designed for motor sport use. These units have an all aluminium body and end fittings to take bearings or metalastic bushes. 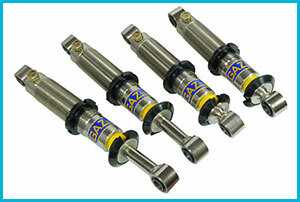 These units have a 14mm piston rod and are fitted with a progressive rate closed cell bump stop. These units can be installed from vertical to horizontal as there is a gas cell fitted in the outer reservoir. Gaz offers a total rebuild and revalve service to back up this high quality product. 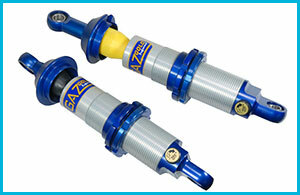 A new quality damper to satisfy the needs of the discerning competition and track day enthusiasts. Built from high tensile alloy to withstand the high stresses that are involved in race conditions. The damper body is hard anodised to give maximum protection against wear during use. 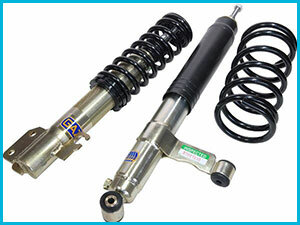 Bump and rebound are on the car adjustable by a single adjuster on the rod and the unit is charged with an inert gas via an internal floating piston.